Refining is the final grinding of all particles in the liquid chocolate together to produce an even extremely smooth texture in which no grit can be detected on one’s tongue or pallet. Conching is a long process of intense mixing, agitating, and aerating of heated liquid chocolate. During this long process various off-flavored, bitter substances as well as water vapor evaporate away from the chocolate. The long intense mixing action assures complete coating of every solid particle with cocoa butter, giving the chocolate a well developed and delicious flavor and texture. We use a professional conche/refiner machine that combines both of these processes into one. The first period of time in the machine is the refining stage, during which time the conching effect occurs simultaneously. 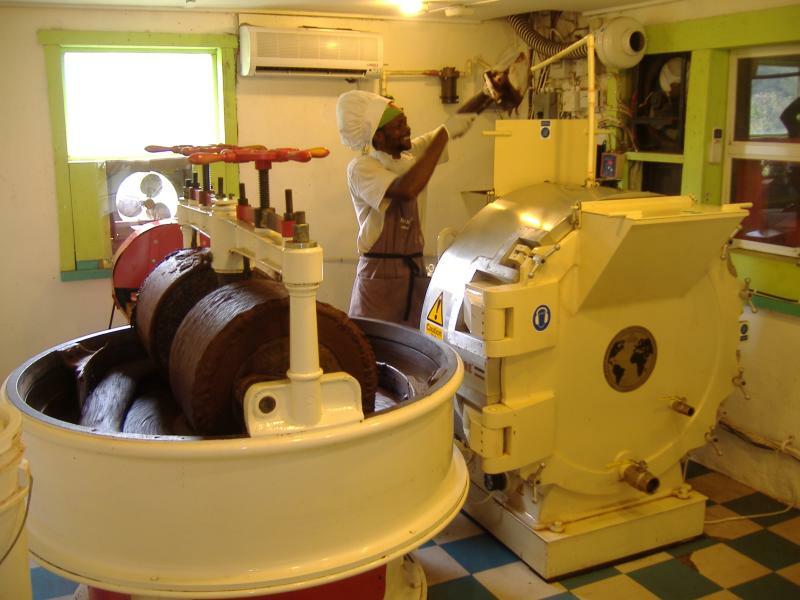 The heat generated from the grinding action of the machine helps heat the chocolate to the conching temperature. During the following period of time, chocolate mixing, agitating and heating continues (conching) until the final flavor is achieved. The chocolate is drained out of the machine and poured into our tempering/depositing machine for the final stage of our long process.